In the early 1900s doctors began to notice that people working around asbestos were dying at an early age. People were dying from symptoms of what is now known as asbestosis. The first case of asbestosis, even though it was not named at the time, was found in 1900 by Dr. H. Montague Murray in London’s Charing Cross Hospital. He was doing a post mortem exam on a 33 year old man who worked in an asbestos textile factory for 14 years. The man had severe pulmonary fibrosis (disease where lung tissue becomes damaged and scarred) and asbestos was also found in his lungs. Murray connected the man’s illness to his job at the factory. Dr. W. E. Cooke was another doctor who linked asbestos exposure to disease. He did a post mortem exam on a 33 year old woman who started working in an asbestos textile factory at the age of 13. Her lungs looked very similar to Murray’s dead patient’s lungs. He named the disease asbestosis. Asbestosis occurs when asbestos fibers that are inhaled become lodged in a person’s lungs and scars them over time. This makes it hard for the lungs to move, preventing them from working properly. It can take between 10 and 30 years to develop asbestosis, but it usually develops after 15 years of exposure. Asbestosis not only makes it hard to breathe, it also makes it more likely someone will develop lung cancer. One in seven people with asbestosis end up developing lung cancer. Asbestos causes cancer in many ways including interacting with cellular chromosomes, generating reactive oxygen species, and interacting with cell mediated mechanisms. Reactive oxygen species are released when the body tries to break down and remove asbestos fibers from the body. Macrophages try to engulf the asbestos fibers and end up failing, releasing lysosomal contents (part of the cell that helps break down substances) into the body. Lysosomal contents being released into the body creates the reactive oxygen species hydrogen peroxide and the super radical anion. These two substances then induce the tumor necrosis factor alpha, which is an inflammatory cytokine (inflammatory substance secreted by the immune system that affects other cells) that causes pulmonary fibrosis. 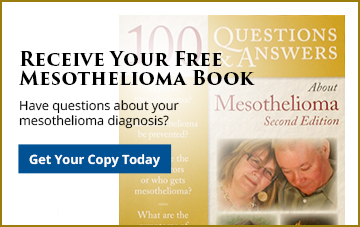 If you have lung cancer, mesothelioma, or asbestosis Goldberg, Persky & White, P.C. may be able to help. For over 30 years our lawyers have helped thousands of local workers and their families who have been injured by asbestos. To speak to an attorney and learn your options call 412-471-3980 or fill out our contact form. If you would like to help with lung cancer research click here to be taken to the Lung Cancer Research Foundation’s donate page. Paul Brodeur, Outrageous Misconduct, pp 10-15 (1985).